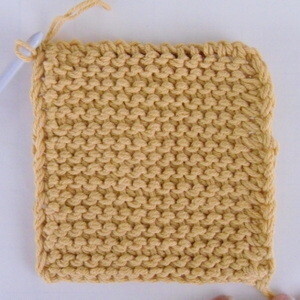 For the purpose of practicing this skill, we’ll make a small, rectangular swatch in this tutorial. 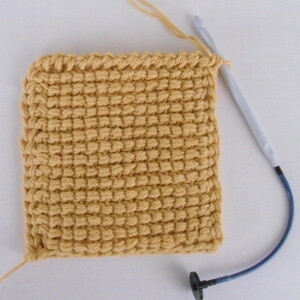 Yarn and hook size don’t matter for this practice swatch. The photo below shows the forward pass of the setup row completed. 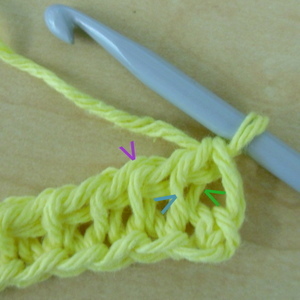 Work reverse pass as shown in steps 11-13 of Tunisian Simple Stitch Tutorial. The photo below shows the reverse pass of the setup row completed. 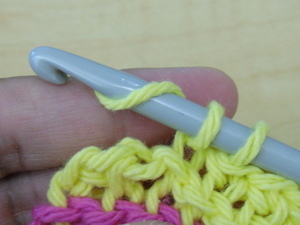 The green arrow is pointing to the back bar of the second stitch. 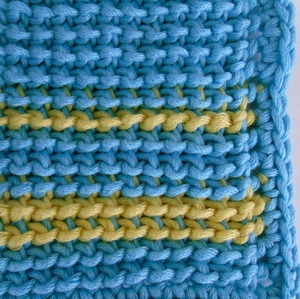 The blue arrow is pointing to the front bar of the second stitch. the purple arrow is pointing to the chain that is created by the reverse pass. 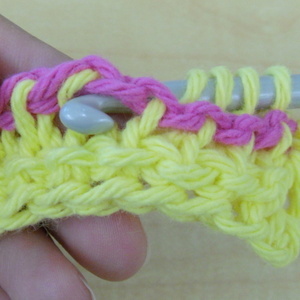 Note: In Tunisian crochet, the first stitch of the forward pass is actually the edge, so we won’t work there, or else we’ll be making an increase. The photo below shows the forward pass of the third row. Since the previous reverse pass was worked in pink, you can see how the chain is flipping to the front. 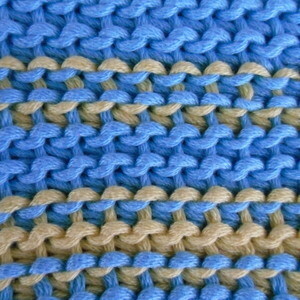 It is this chain that gives Tunisian revers stitch its richly textured look. 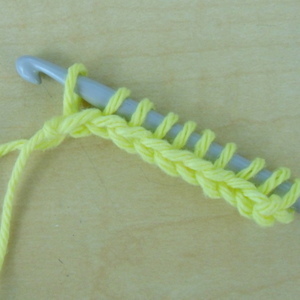 The photo below shows the hook working from behind under the chain. The photo below shows this is progress. Back of 14-stitch Tunisian Reverse Stitch swatch. Tunisian reverse stitch is unique, and I think you’ll find some great ideas if you give this tutorial a try. I think it would make a luxurious washcloth because of its shape and deep ridges. What will you use Trs for? If you have any questions or need any help, please leave a comment below! This entry was posted on Tuesday, October 8th, 2013 at 12:00 AM by Caissa "Cami" McClinton	and is filed under Tutorials and Help. You can follow any responses to this entry through the RSS 2.0 feed. You can skip to the end and leave a response. Pinging is currently not allowed. 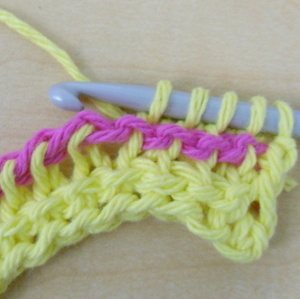 I learned this as Tricot purl stitch/garter stitch.